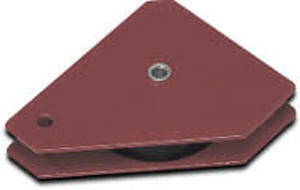 We are the Manufacturers & exporters of a wide variety of "Magnetic Tools". Especially designed to use with Dial gauges to work on surface plates and Machine Tables. With two magnetic phases and fine adjustment with universal clamp. With two magnetic phases heavy duty with universal clamp. Horizontal or Vertical positioning capability. Magnetic Pull approx. 50 Kg. Magnetic Base elbow joint flexible arm with two magnetic phase. Dial Gage Holder includes fine adjustment. Magnetic Pull approx 50 Kg. Magnetic clamp for fast accurate holding. Well suited for fast and accurate holding of Ferrous metals for welding and Assembly. Compact Design with Powerful Magnetic. Positive gripping pot magnets supplied with screw down release handle. Can be used singly or in multiples for making welding or other jigs. many different angles by adjustment and locking of wing nut. Widely used for Holding and Welding. Compact in size for holding work in confined spaces. Has unlimited applications such as magnetic fasteners, displays, holding maps etc. The dream of many people to adorn their wrist with Rolex watch can be fulfilled by these cheap rolex replica that are well-known for their classy look and are accepted worldwide by the common men of the society. Cheap replica watches help fashion lovers to maintain their reputation in the society and sometimes it becomes important for businessman to flaunt their style in order to attract clients. These rolex replica simply draw the social attention and uplift the status of an individual. There are various designs and styles available with the cheap replica watches and each watch has something exclusive about it that looks amazing and really fascinating. They are rolex replica uk the hot favorites as they are affordable and can match with different outfits.